Planetary Poseidon within a birth chart brings enlightenment and an illumination of ideas and ideals in a way that is positive, grounded and can be used in our everyday lives. It is represented by two crescent moons, one facing upward and the other down, bound by a bar. The bar holds the receptivity of the two moons which then can resonate back out in the form of wisdom. When we turn the symbol 90 degrees we get the symbol for Pisces, and there are similarities. Poseidon in Astrology. The planet of enlightenment and wisdom. 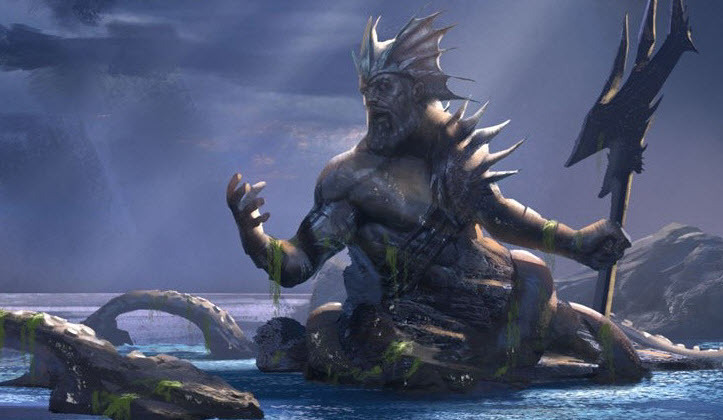 Poseidon was as was Neptune, god of the sea. Poseidon was also god of earthquakes and horses. He is often depicted with a horse and sometimes a dolphin or a ram. He drove is chariot over water and through waves of unquestionable dominance often drowning people in his wake, and in their death their souls remain suspended over the ocean. Poseidon stands for enlightenment and wisdom. As he rode over his victims he illuminated a clear passage to their death, suspended over the ocean but within truth and light. Poseidon is transparency, it’s higher consciousness, clarity, truth and ethics. It’s all about illumination so you can find it in the charts of anyone from inventors to visionaries to spiritualists, to people who are great in the advertising business because it involves shining the light on something. Let’s take a look at Poseidon at work in the chart of Chelsea Clinton. Now all planets can run the spectrum from positive to negative in their expression. Here, in Chelsea Clinton’s chart we find a powerful Poseidon energy, the planet of inner wisdom, inspiration, and illumination of ideals, but it’s a hindered Poseidon energy. Highly individualistic and sensitive, Chelsea has a deep need for emotional self expression but her chart indicates she finds this hard to achieve in practice, spending considerable time chasing experiences which turn out to be less than expected. Around her Meridian, and remember the Meridian is like a snapshot of the soul, the point of individuality, what you really would like to achieve regardless of whether it brings attention and recognition from the outside, we have this major structure here involving Neptune, Poseidon, Admetos and the Sun that complete this 4-point picture. So when the Poseidon/Neptune = Meridian come together we can get someone who has a deep clarity, knowledge and wisdom of themselves, someone who is introspective and has a lot of insight. But if not operating well in a chart and there are indications in Chelsea’s chart that confirm this finding, our knowledge of ourselves is foggy and unclear, we can have false ideas and views of ourselves that keep us on the wrong path and in a mirage, clear insight into ourselves is not accessible for some reason and seems to slip through our fingers. The Admetos joins the Poseidon here and the Admetos deepens, stabilizes and solidifies energy, or it can block energy creating suppression. So with the Admetos/Poseidon = Meridian we get a person with a lot of mental depth. This is someone who would like to take her ideas and ideals and shine the light on them in a profound and grounded way. Admetos/Poseidon is also the midpoint structure for education. But the Admetos can also be blocking the energy of the Poseidon, creating limitation, and this is what appears to be happening. The Sun/Admetos = Meridian here is saying Chelsea has strong needs to feel deeply involved in her work but that there are feelings of restrictiveness, that she’s really not getting her needs met in this area. Rounding out this major structure we have a Sun/Neptune = Meridian midpoint, someone who is highly sensitive to energy and can use these sensitivities for the greater good, creatively, spiritually, or in some kind of helping profession, but if not operating well we can have a negative outlook and there can be a loss of ego strength and confusion or even depression at times around the career. Chelsea is a fiercely independent and individualistic spirit as seen by the planet of personal freedom and individuality, Uranus in close aspect to her Meridian, but other parts of her chart are telling us that there's a lot of confusion and uncertainty when she strives for her personal goals and that there's some ambivalence when it comes to dealing with the public. She can give the sense at times like she’s driving but with the brakes on. But where does this conflict come from? When we go to the Moon, and the Moon is our emotional needs, our emotional unconscious, what we need for our emotional peace and wellbeing, it’s also the mother. With Saturn here, the planet of security, stability, reliability and also the planet of limitation, it is saying Chelsea had a strong attachment to her mother, but that there was also a lot of restrictiveness. And lets look even further and go to the Moon/Ascendant midpoint structure (below), the midpoint structure that most specifically describes the mother as well as Chelsea's experience of her. Here we confirm our findings even further. Venus/Pluto and the Mars/Jupiter around the Moon/Ascendant midpoint, this was a passionate mother with a strong instinctual desire who really loved her daughter but with those power planets of Mars and Pluto, she could be pushy and contentious. This combination can also mean that Chelsea could find her mother at times a great source of strength. So here is where some of the conflict lies because Chelsea did see her mother as a source of inspiration but there was also restrictiveness (this is also confirmed by the Ascendant/Saturn midpoint structure on the side ~ not highlighted in the chart above). She would have needed a more delicate encouragement in order to gain the confidence to develop her own inspired visions. Instead she received her mother’s competitive energy. So there’s really a lot there with Chelsea, she’s an individualistic spirit with strong ambitions and inspired visions. But troublesome emotions arise when Chelsea aims to bring more of Chelsea into the arena, hiding away her deeper drives she feels would provoke opposition. This is a very old pattern that can be traced to her early environment, but these deeper drives are positive and healthy impulses that are necessary to ignite her passionate visions. She probably experiences this as a stealthy tension, never finding herself satisfied and yet unable to say just what the dissatisfaction is. So this is where the mirage in her life resides, Neptune/Poseidon = Meridian, her need for inner clarity, for intimacy with herself but struggling with the reflected image. But if Chelsea can work to transform the uncertainty and fear around bringing more of Chelsea to the fray, that same Neptune/Poseidon can set the sail to her visionary ideas and ideals. Charting people of interest through the Uranian system of astrology. The Uranian system illuminates patterns unlike any other system of astrology. With the dial we move right into the heart of our personal story, our potentials as well as our dilemmas, opening up the kind of dialogue that brings workable perspective into our lives.